Society beckons us to succeed-to achieve excellence in our appearance, our earning power, our family life. God Himself also beckons us to be women of excellence. But what exactly is He asking? If you're hungry for God's perspective on success in a society that bombards you with conflicting demands, feed on the truths of God's Word that you'll discover in these pages. You will not only learn to "approve the things that are excellent" but will also experience the joy of becoming God's woman of excellence. This bestselling topical Bible study has helped over one million women over the past 30 years, and is newly revised and updated so today's women can discover who God designed them to be in this day and age. Written by Navigator author and Bible teacher Cynthia Heald, the 11 sessions in this Bible study explore what your identity in Christ is and how you can best serve Him. 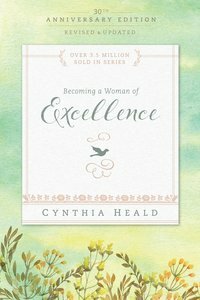 About "Becoming a Woman of Excellence 30Th Anniversary Edition (Becoming A Woman Bible Studies Series)"
Cynthia Heald speaks frequently for church womens retreats and seminars nationally and internationally. She loves to share the word of God, be with her husband and family, take bubble baths, have tea parties and eat out! She is a prolific author of Becoming a Women of Excellence, Intimacy with God, Loving your Husband, Becoming a Woman of Freedom, Becoming a Woman of Purpose, Becoming a Woman of Prayer, and a Gold Medallion winning devotional book, Becoming a Woman Who Walks With God. Customer Reviews For "Becoming a Woman of Excellence 30Th Anniversary Edition (Becoming A Woman Bible Studies Series)"
This little book holds nuggets for living life in a big way. Its simplicity is good for those who have little time to read, and it would be very suitable for small group discussions. It is enlightening and offers the reader insights that liberate one to live a higher life of excellence, without legalism. Only the bible way is sustainable and this book unpacks how. A recommended book for personal growth! Order now to secure your copy when our stock arrives. Other edition is available. 9781631465642 0 Available. Expected to ship in 6 to 7 weeks from Australia. In this motivating Bible study for both married and single women, you will discover what you should be striving for as you look to God's excellence as a model. These 11 lessons will help you understand what excellence means in such areas as surrender, obedience, discipline, discretion, wisdom, purity, and a gentle and quiet spirit. If youre hungry for God's perspective on success in a society that bombards you with conflicting demands, feed on the truths of God's Word that you'll discover in these pages. 114 pages, from Navpress.